Sir James Somerville (1882-1949) was one of the great influences on the 20th-century navy, both as a commander of fleets and a pioneer of radio and radar. The Admiral's extensive correspondence, diaries and reports are deposited in the Churchill Archives Centre at Cambridge. These edited selections reveal much of the background about major naval operations in the Second World War. The loneliness of high command is clearly revealed in these highly personal documents, almost 500 of which are reproduced in the book. 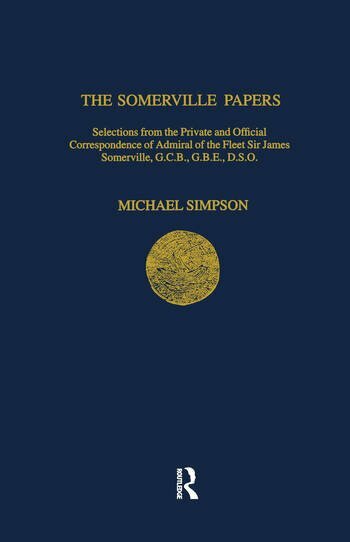 In particular they show Somerville's frequent disagreements with Churchill - a feature common to all senior British commanders during the war. Contents: List of Maps and Illustrations; Preface; Acknowledgements; Glossary of Abbreviations; Chronology of Admiral Somerville's Life and Career; PART ONE: Flag Commands and Other Active Service, 1936-1940; PART TWO: Force H, June 1940-January 1942; PART THREE: The Eastern Fleet, February 1942-August 1944; PART FOUR: the British Admiralty Delegation, Washington, October 1944-December 1945; Index; List of Documents and Sources.